Spanish melodic metal band, KILMARA, have released a single & music video for "Out From The Darkness...", the song is taken from their fourth album Across the Realm of Time, out August 31, 2018 via ROAR Rock Of Angels Records. The album was produced, recorded, mixed & mastered by Roland Grapow (LORDS OF BLACK, MASTERPLAN, SQUEALER, BLACK MAJESTY, EAGLEHEART). Artwork made by Didac Plà. The video can be viewed on KNAC.COM HERE. Guests on the album are Jordi Longán (ex-IPSILON), keyboard solo on "Principles of Hatred", Roland Grapow (ex-HELLOWEEN, MASTERPLAN), start guitar solo on "My Haven", background vocals on “crawling from darkness” and “Out From the Darkness...”, Viktorie Surmøva ( SURMATRA, ROSA NOCTURNA, VICTORIUS), vocals on "I Shall Rise Again". 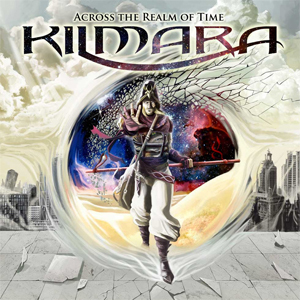 The powerful melodic metal band KILMARA presents their new masterpiece Across the Realm of Time. After three albums, the debut Haunting Dreams, the work that put them on the world map, Dont Fear the Wolf and their fantastic third album Love Songs And Other Nightmares, it was time for KILMARA to make their fourth album, the most important of their career. With the incorporations of the American singer Daniel Ponce and the virtuoso Argentinian guitarist Miguel Laise, KILMARA returns to revolutionize their sound being now more melodic, faster and powerful, but without losing the class and mastery that characterizes them. Across the Realm of Time is the definitive work and consecration of KILMARA, a new step to conquer all lovers of quality metal. KILMARA has created a collection of incredible songs that are inspired by melodic heavy metal and European progpower metal always looking for a modern and elegant sound. KILMARA is today one of the most powerful and innovative bands to consider in the modern metal scene. With a past-present-future concept as a basis, this is a circular work in which to submerge and let yourself be carried away by the passion that exists in each topic from beginning to end.